Scottsdale, Arizona, (population 240,000), located 18 miles northeast of Phoenix, was settled in the late 1880s, attracting health-seekers and people interested in the potential of irrigated farming. Over the next several decades, the town grew as a service center for surrounding ranches and farms. In the 1920s and ‘30s, as resorts were established in the valley, Scottsdale became a popular place to visit. Tourists could see the rustic lifestyle of the West, complete with cowboys and Indians, and enjoy colorful festivals of the local Hispanic community. The Depression saw an influx of artists and architects, due in part to the establishment of a federal Works Progress Administration center. Frank Lloyd Wright established Taliesin West in the rugged Sonora Desert at the foothills of the McDowell Mountains in Scottsdale in 1937 as his winter home, further solidifying the area’s reputation as an arts colony. Scottsdale was incorporated in 1951, and its downtown expanded in all directions with businesses that catered to the growing tourist market. The larger community grew as Motorola brought in workers for the emerging electronic industries. Today tourism remains a major component of the economy, which has also diversified to include high-tech and biotechnology companies, healthcare, and research and development. The Scottsdale Historical Museum is housed in the 1909 Little Red Schoolhouse. Docents conduct walking tours of downtown historic buildings and hold an annual historic house tour. The Papago Trail along the city’s historic canal system is used for walking and biking and links museums, historic and archaeological resources, and other cultural attractions in the area. Taliesin West, a National Historic Landmark, includes Wright’s office and studio, his school of architecture, and living quarters for students. 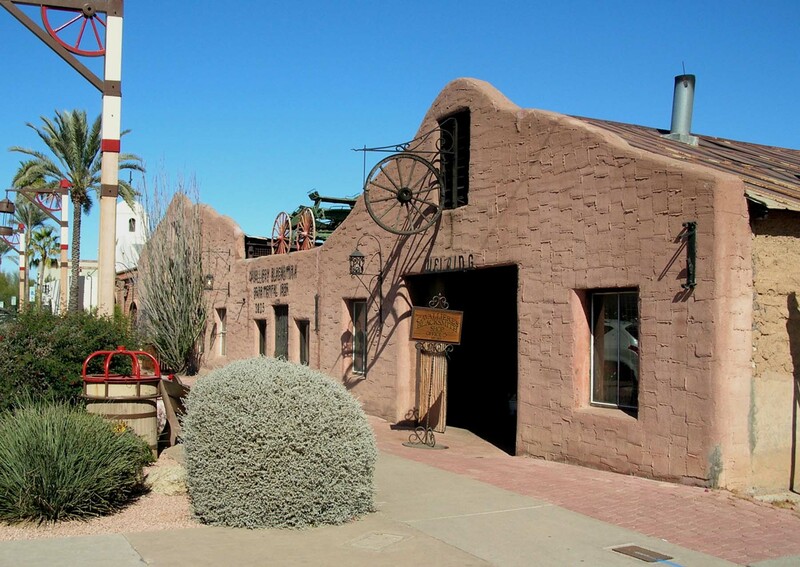 The 1920 adobe Cavalliere Blacksmith Shop is still in operation today. Another historic attraction, Our Lady of Perpetual Help Mission Church, was built in 1933, and features thick handmade adobe walls, a prominent bell tower, stained glass windows, and arched openings.